Angels are everywhere, helping us when we don’t deserve it, when we are faced with a job too big just for one, and when we are worn out. 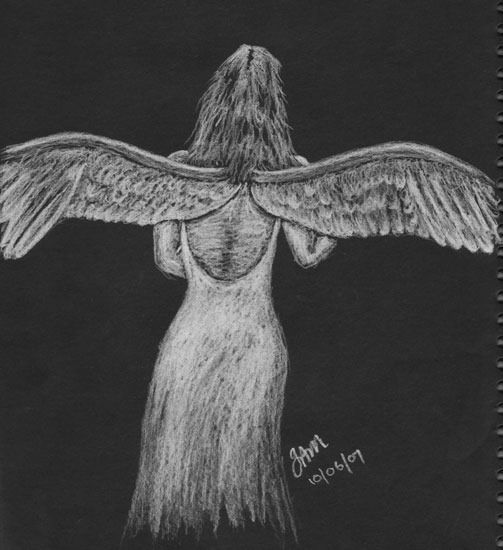 Angels don’t need to be the dressed all in white, with white feathery wings springing from their back, but they can be the type which are disguised as friends, strangers with a kind word, and that miraculous escape. They are the ones who are there when you need them the most whether you know it or not. They are put into your life, and even if you don’t believe in God, you can still see the sense in what I am saying. I have seen evidence of angels lately and I thought I would point them out, just to show you how everyday they can be. Example 1 – Our next door neighbour’s son was involved in a pretty bad accident a couple of weeks ago, with his front passenger seat ending up behind the drivers seat. He did sustain some bad injuries, which landed him in ICU for 2 days, but he was out of hospital within a week. According to what I heard, he shouldn’t have been here, especially with the damage the car sustained. Even his mother agreed someone was watching over him that day. Example 2 – we are moving house. Let me correct myself. We have moved house and are in the process of cleaning it. The house was found after putting out a prayer request to church and within half a day, we were offered a temporary solution. It isn’t ideal, but means we have a roof over our head and some breathing space, and an excuse to reduce our contents (which is still going on). I call it our holiday house. Example 3 – Cleaning the other house is a large job, a very large job. I was so overwhelmed by it, that I didn’t know where to start. I am fortunate to have some angels show up in the form of friends who are helping me, either with physical labour or by lending their child minding services (so the kids had some school holiday fun), or their ladders. All of these things have made my job easier and more pleasant. Without these angels, I would not have been able to take today off. Example 4 – Doing a long and particularly challenging run this morning (10km along a beach) I was able to enjoy it more as I was provided with distractions. There was one lady who told me about dolphins so I spent the next 1.5km looking out for them, there was the brief company of a mother and her son, friends cheering me on as I crossed the finish line, the 4 lines of a song which i sang to myself in the last 3km of the race, the smiles and good work comments from other runners, and the fact I bested the time I set for myself (did 1hr28min). Oh, and I had just the right amount of money to buy lunch for us and a bottle of honey. It was a good morning out. So, a big thanks to all of the angels in my life, the ones to come, and those I will never see. It makes life that little bit easier.